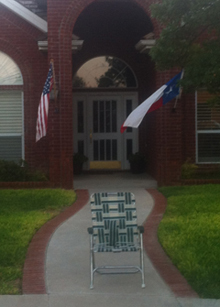 In honor of the great message that Clint Eastwood delivered to the Republican National Convention last week, there is a one-day grassroots movement effort to encourage all Americans to place an empty chair near their front sidewalk. The empty chair represents all of the empty promises that were made by then Senator Barack Obama four years ago. Specifically, the empty chair represents the 23 million Americans who are either unemployed or underemployed due to the disastrous economic calamity that Mr. Obama has led us in for the last four years. Economically speaking, after four years of an Obama Presidency, we have lots of bills, no pocket change, no jobs and no hope with another four years of an Obama Presidency. Mr. Obama does not deserve another contract renewal. Please support this grassroots movement and place an empty chair near your front sidewalk after you have placed your flags. And, come November, please remember to vote for Mitt Romney for President.